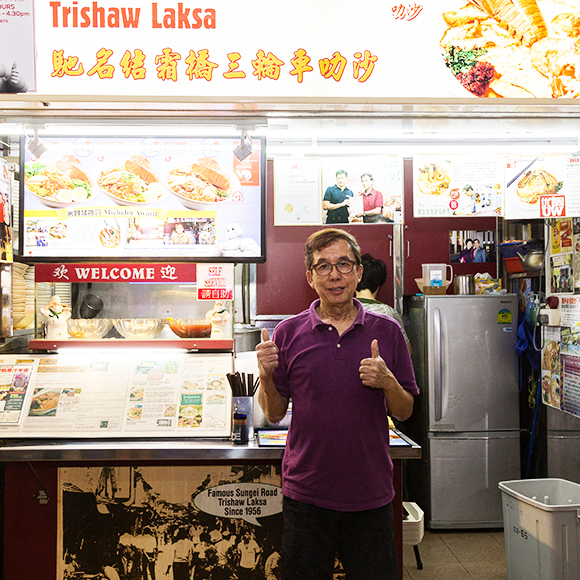 18 years ago, the hardest part of being a hawker was to build up a strong customer base. Back then, I never thought I’d be involved in the food business, but all that has changed now. Most of our customers are working professionals from the office buildings around Hong Lim and business has definitely been good. I feel that Laksa is definitely a Singaporean favourite. What’s not to like! One of my most memorable moment in Hong Lim would have to be the day I was awarded the Michelin star. Just look at that! and here’s another picture of when I won a Laksa Challenge in 2013. I feel very blessed to have come this far as a hawker and never really thought of slowing down anytime soon. As long as I’m able to cook, that’s what I’ll do!